Between the 8th and 11th centuries, following the Crusades, the Moors of Spain introduced the fine art of rug making to the Europeans. Although Oriental rug designs significantly influenced early European rugs, various regions in Europe began developing individualized techniques and styles over time. For example, 17th century France saw Aubusson and Savonnerie factories creating some of the most desired, exceptionally woven rugs purchased exclusively by the wealthy and the regal. From about 1650 to 1740, rug makers in Savonnerie (Marseille), France worked day and night to make rugs specifically for the Royal Palaces. In England, the city of Axminster in the 18th century produced top-quality rugs that segued into the popular arts and crafts style of the late 1800s. Most weavers fleeing to France during the Spanish Inquisition were members of a Protestant denomination calling themselves Huguenots. Henry IV issued the edict of Nantes granting all non-Catholic people the freedom to worship as they pleased. This edict protected carpet and rug weavers in Aubusson from persecution and possible death by guillotine. As a result of the edict, Aubusson rug weavers developed into some of the most talented in the world. Antique Aubusson and Savonnerie rugs are considered among the most superb examples of rug-making in Europe. Included in our European antique rugs for sale are magnificently woven, stunningly gorgeous Aubusson rugs that would transform any environment from commonplace to radiantly rich and sophisticated. Exemplified by a classical art revival encompassing literature and architecture, the English Renaissance (1300-1500) saw the emergence of Aubusson and Savonnerie rugs that became extremely popular in royal palaces and aristocratic mansions throughout Europe. Similarities between Savonnerie and Aubusson rugs include being originally hand-woven, copying Rococo and Baroque coloring and floral styles seen in the 17th and 18th centuries and heavily influencing Spanish rug weavers during the 18th and 19th centuries. Unique differences separating Aubusson and Savonnerie rug styles involve the fact that Savonnerie rugs were exclusively woven for palaces by special order, mostly decorated elegant ceilings of rooms for which they were specially made and decorated with coats of arms, heraldic devices and naturalistic floral motifs. 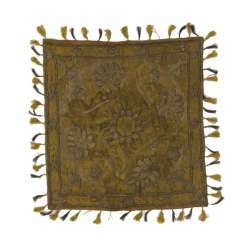 Alternately, Aubusson rugs originally copied Turkish styles of rug-making, emerged primarily in the middle 1600s and incorporated lovely floral medallions surrounded by naturalistic floral motifs. Vintage Romanian rugs reflect three different styles evolving in Transylvania, Oltenian and Moldavia. Romanian antique rugs are primarily based on kilims originally used to decorate walls or as blankets. 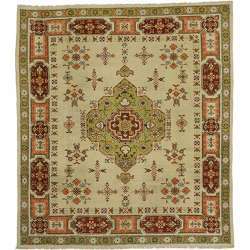 Rugs woven by Moldavian weavers usually incorporate the tree of life symbol using muted hues. Oltenian rugs have green or black backgrounds overlaid with scenes and figures similar to those of Persian miniatures. Finally, Transylvanian vintage rugs are heavily influenced by Oriental rug designs, bursting with lovely landscapes depicting animals, birds and stylized blooms. These flat-woven rugs originated in Ukraine, Moldova and Russian provinces during the late 1800s and early 1900s. 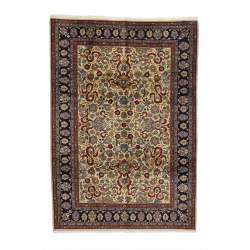 Some rug experts suggest knotted-woven rugs were made in the Ukraine while only flat-woven rugs are truly Bessarabian. Members of the aristocracy in the 1500s commissioned Belgian tapestry weavers to create wall coverings depicting hunting scenes and verdant landscapes. Later, Flemish tapestry makers moved to Britain, Italy and France when they were uprooted by wars between Spain and France, where they adopted intricately detailed art works into their tapestries. Our clients are always thrilled to find knotted Spanish rugs included in our modern European rugs collection. Soft colors dominated by rose reds, natural yellows and soothing ivories highlight vintage and modern Spanish rugs, which are perfect as complements for all architectures — from opulent homes to dignified museums to high-end business buildings.